Karen is a single mother of four children living in public housing. Her gas and electricity were disconnected for about a week in October 2014. At that time Karen was a victim of domestic violence. Her children had been removed from her care as it was not safe at home. As a result Centrelink switched Karen from the parenting payment to the lower Newstart allowance. On Newstart Karen received about $500 per fortnight, of which $360 went to rent. At the same time as Karen’s income decreased, her situation triggered extra costs. Her children stayed with her brother 250km away, and Karen drove to visit them three times a week. She used up her modest savings on petrol costs, and fell behind on rent and bills until she had more than $5000 debt. Karen was suffering from depression, anxiety and post-traumatic stress disorder, which made it hard for her to manage finances. At one point she was hospitalised because of her deteriorating mental health. At first Karen continued to make minimum payments on her bills, but her debts escalated. She called her electricity and gas retailers – Simply Energy and Origin Energy – to explain her situation. They each said she owed about $2000 and must pay 75% up front to avoid disconnection. Karen offered to pay each company $150 instead, but both refused her offer. Karen had been on hardship programs for her gas and electricity bills previously, but was disqualified when she missed payments. Both retailers refused to allow her back onto hardship programs. Eventually, Karen’s electricity and gas were disconnected. Karen says retelling her story to different people each time she phoned a retailer caused her to relive traumatic experiences. Unsympathetic and accusatory staff made it even more difficult. Karen stayed at home throughout the disconnection. She was too embarrassed to tell friends what had happened, and had nowhere she felt comfortable going. She washed quickly with cold water, used a public laundry, and ate cereal, takeaway and cold canned food. When she visited her children she bought takeaway for them too, which became expensive. The food in her fridge and freezer went off, and her fridge blew up because melt-water got into the motor while it was turned off. It cost Karen $400 to replace it. Karen says she felt hopeless. 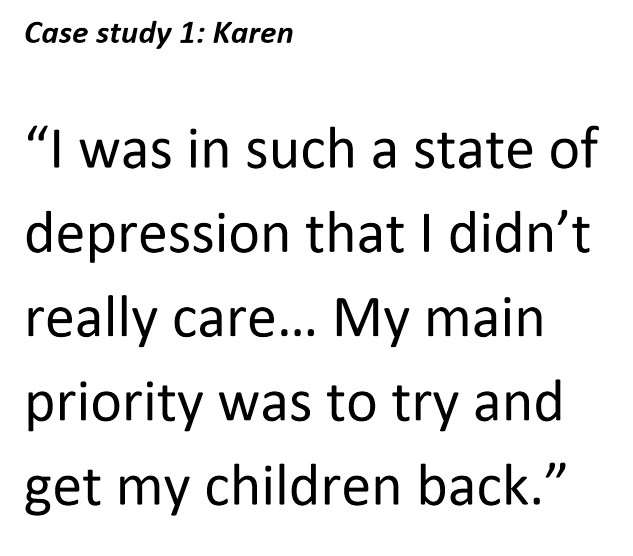 Then the Department of Human Services said Karen’s children could return home if things were in order, and that motivated her to address the disconnections. She contacted MoneyHelp, who referred her to EWOV; they negotiated on Karen’s behalf and her services were reconnected the same day. EWOV also discovered Origin Energy had not been applying the concessions Karen was eligible for. Resolving this reduced her debt by about $800. Once EWOV got involved, Simply Energy agreed to put her back on a hardship program and accept regular payments. Origin still refuses to allow her onto hardship, and calls her regularly to demand a large up-front payment. Karen expects they may disconnect her gas supply again. Karen says she wants to clear her debt and move on, but cannot pay what Origin demands.